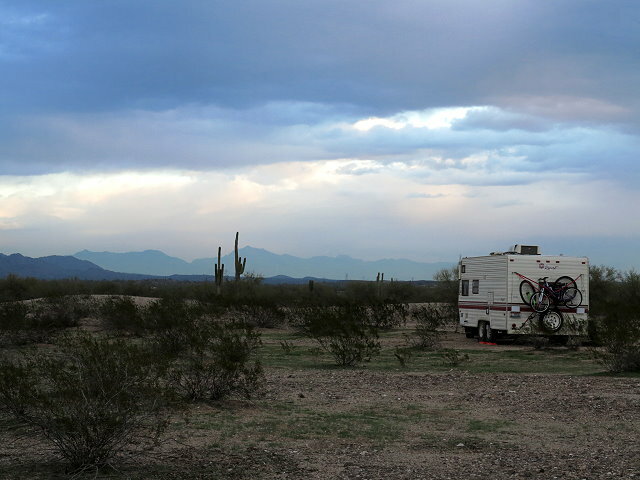 Friday January 20th – this Buckeye BLM place in the Sonoran desert of Arizona is very peaceful and would be an okay place to set up for awhile, except that we need to get to the Quartzsite area today. Clifford has a call with Dr. W and Dr. S this morning, so I don’t do much packing until the call is done. After the call, we finish packing and are soon on our way. The drive north on state highway 85 to I-10 is easy, but once we head west on the interstate, it becomes increasingly windy. Thank goodness for the new sway bar which provides some stability in regard to both the wind and the semi traffic. 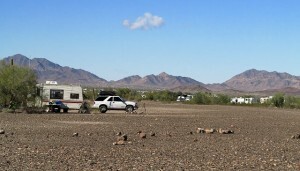 At Quartzsite we turn south on hwy 95 and drive to the La Paz turnoff, passing La Posa, the BLM long-term dispersed camping area where hundreds and hundreds of RVs dot the landscape. 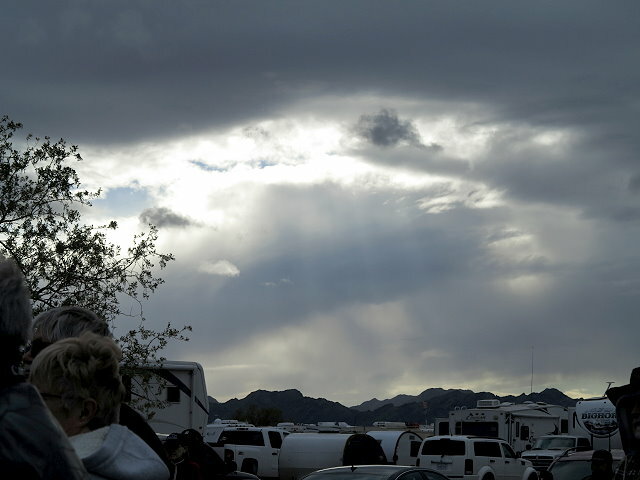 La Paz is also BLM dispersed camping, but is short-term only and appears to be where gatherings are held. 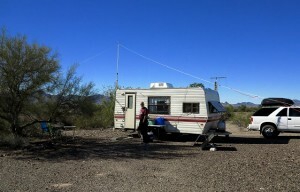 We are here for Quartzfest, the week-long convention of amateur radio enthusiasts. Our entire trip has been geared to being here by today. Wow, we made it! We drive around and find a spot alongside a wash, as the little gullies across the sandy desert floors are called, with a palo verde tree and several creosote bushes to provide some privacy. There aren’t so many people along this section of the wash, which is nice, but we will have a bit of a walk to get to the main fire-ring/gathering area for the events and activities. As we are setting up, it starts to rain, and as the evening goes on, heavier rain and strong winds buffet us. 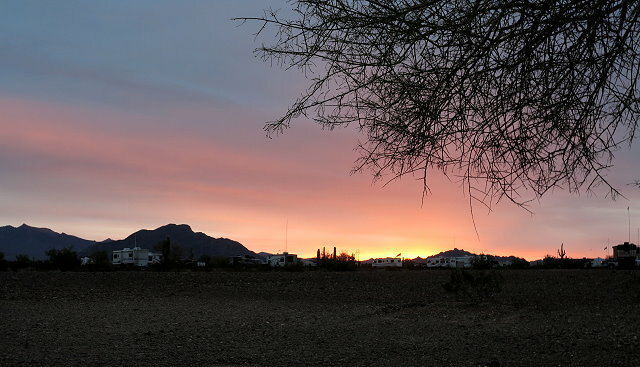 I don’t sleep well – too many sounds: the ambient sound of thousands of generators across the desert, highway traffic, water rushing down the wash (which was totally dry earlier today), and something loose slapping against the side of Terry, our RV. 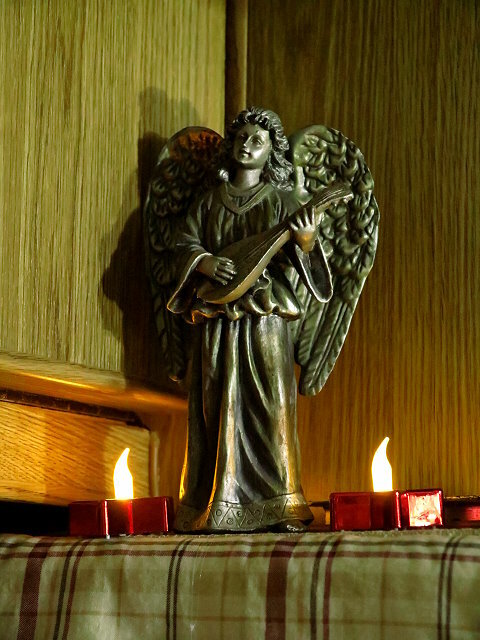 Saturday, January 21st – I am up about 8:00 a.m. CT (Clifford Time – he is still operating on Mountain Daylight Time) and it is barely light out. Almost all the water is gone from the wash, but we can see how high it got. A sunny day allows for more laptop time, so I do some editing, blog posting, and emails. A little walkabout provides time to take photos, but being surrounded in all directions by RVs doesn’t exactly inspire me. A cell photo posted on Facebook suffices to let people know where we are. Sunday January 22 – it is overcast this morning with a little sprinkle, but nothing like yesterday’s rain. After breakfast we walk down to the Welcome Center, just checking things out. In the afternoon, I walk down again to get us registered and then awhile later we join others at the main fire-ring for the opening ceremony – introduction of organizers and volunteers, a run-down of upcoming events and activities, pointing out where such will take place, and a generous raffle. There are at least a hundred people gathered for this. In the evening, I do some editing for Becka while we listen on the radio as people help guide late-comers in. It is confusing to find one’s way around in the daylight, let alone after dark. Tomorrow the activities will begin in earnest.